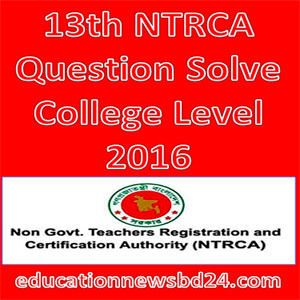 13th NTRCA Question Solve College Level 2016 found here. Download 13th NTRCA Question Solve College Level from here. NTRCA stands for Non-Government Teachers’ Registration and Certification Authority (NTRCA). Preliminary Test of College Level was held on Friday 13 May 2016 10:00 A.M to11:00 A.M and Preliminary Test of School & School-2 Level was held on Friday 13 May 2016 04:00 P.M. to 05:00 P.M.